I’ll take all the Benny’s please! So, I mentioned a couple weeks ago that Sam and I had made plans to go to the Houston Tristar Collectors Show. I scanned everything after we got back, but life got busy, and I hadn’t made a post about what I came home with. There’s nothing truly earth shattering in terms of the cardboard, but I had a great time hanging out with Sam, we don’t get to do that too often. 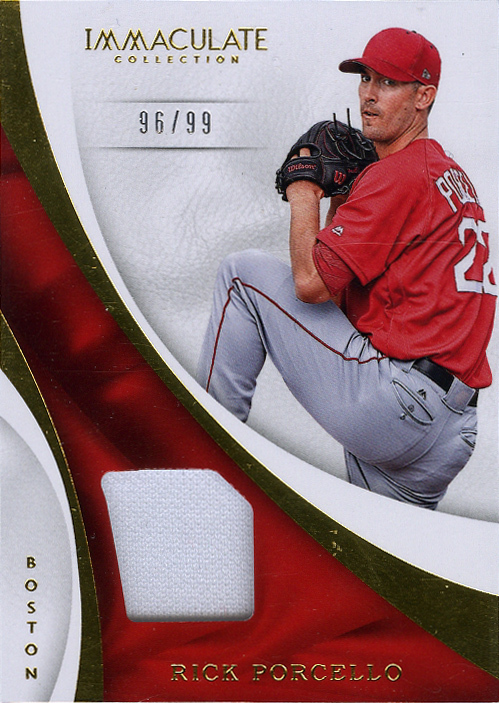 Speaking of, let’s start with the only non-Red Sox cards I picked up. I don’t claim to actively collect Astros cards, but I certainly don’t avoid them either. I’ve always felt it’s good to have a couple rookies cards for obviously talented players. Absolutely nothing wrong with picking up a Bregman and a Correa. There on the right as two Singleton RCs, Bowman Platinum and Bowman Chrome. Then last years Bowman Platinum for Bregman and an early Panini Prizm Draft Pick card for Correa. Let’s just jump right in here and get started. I’m always pleasantly surprised (because I can pick them up for cheap) with how little love Manny Ramirez gets at card shows. People will literally give away cards. I get it, he used drugs, I don’t care. He’s never getting into the Hall, and I’m ok with that. I also enjoyed watching him destroy baseballs. I always mention, every time I make a post like this, that if he hadn’t used PEDs, he still would have been one of the greatest contact hitters ever. He would have had considerably less power, but we’d be including him in every “greatest of all time” discussions about OPS and RBIs. Fun fact, he has 8 less RBIs than Ted Williams. 19th all time. Manny was fun as hell to watch. Three cards I wanted to point out. First, two rookies that I had never picked up the parallels of. 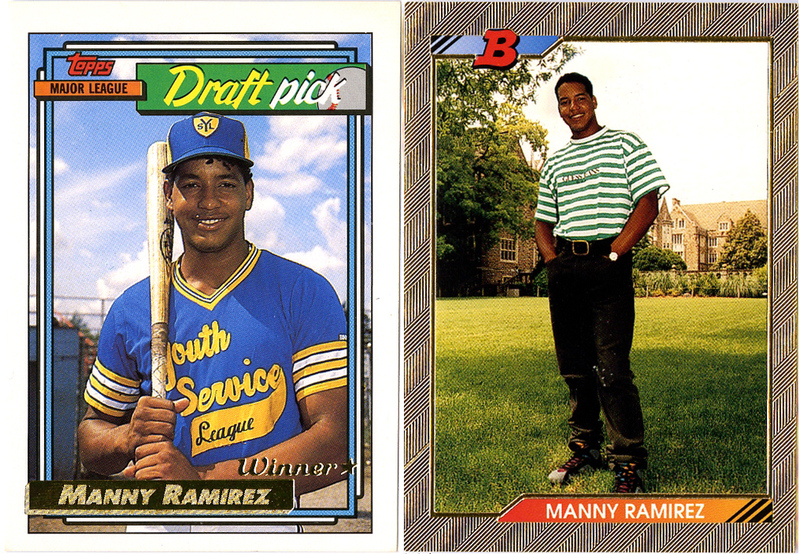 I already had both the ’92 Draft Picks and the iconic ’92 Bowman, however, I had never run across the Topps Gold “winner” variation of the draft picks or the gold foil parallel of the Bowman. Both are awesome additions to my collection. 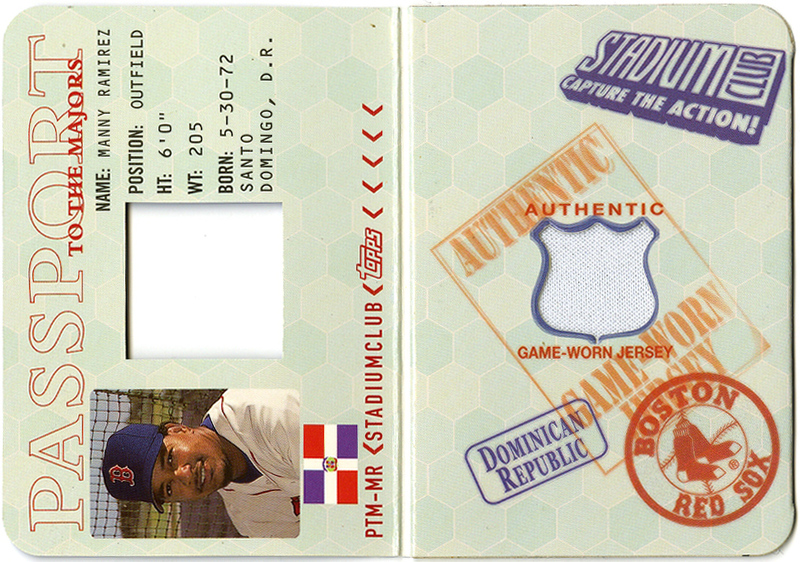 Lastly, that “blue square” card in the upper right corner of the previous photo, that was a Stadium Club “Passport to the Majors” relic, and #1115/1200. In case it wasn’t obvious, I scanned most of the cards in sections, just to make life easier. 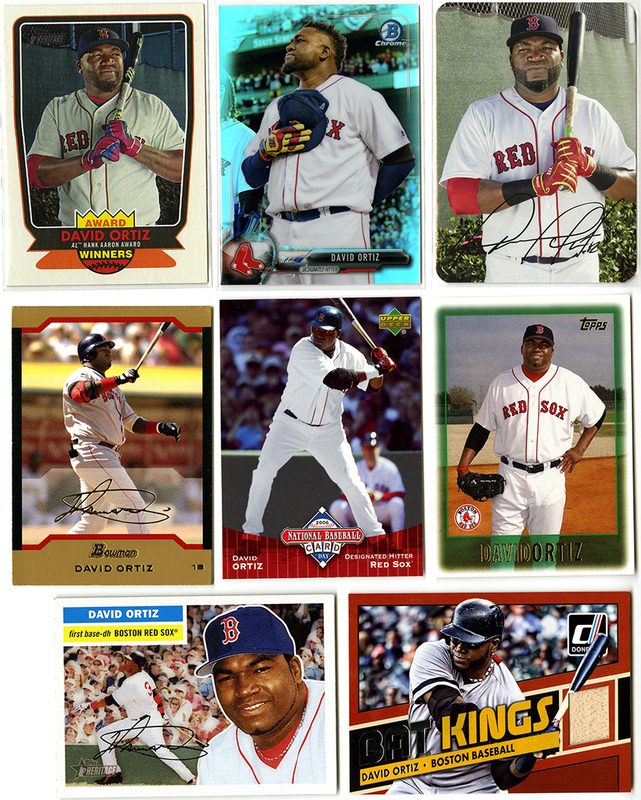 There’s a couple of the better card, scanned individually, towards the end, including a nice Ortiz. These were a few random ones that were scattered among the dime boxes. I couldn’t remember which Heritage inserts I had or needed, so I grabbed both. The Bowman Chrome is a refractor. 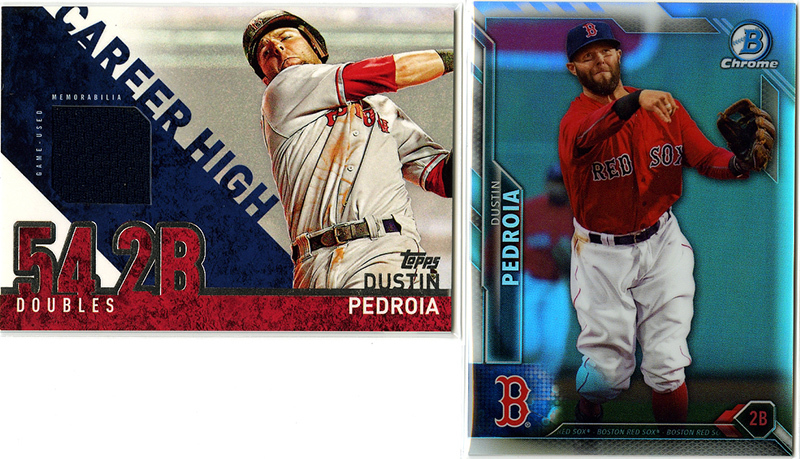 The three in the middle were ones I just didn’t recognize as having in my Ortiz player collection. The Bat Kings relic from last years Donruss, at the bottom, was a nice pickup for a dollar. 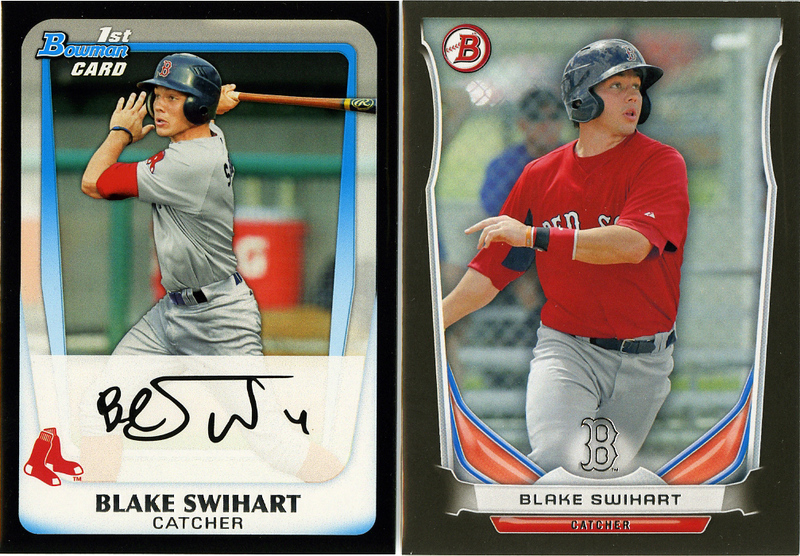 Couple rookie cards for Chris Sale and Blake Swihart. Cards shows are really awesome for find those $3-5 cards on ebay, for $0.25. Every seller at a card show is trying to move inventory, and half the tables are things like “3 for $1” or “15 for $10”, or some crazy combination like that. The more “base” a card, the more likely it’ll be in a quarter or dime box too. I don’t remember what sort of box these came out of, but let’s just say they didn’t exactly break the bank. The Sale “Bowman 1st” card is one of those I don’t remember seeing on eBay for less than a dollar, so that was a solid pick-up. I only had one Sale RC previously, and it was from (*cringe*) Lineage. 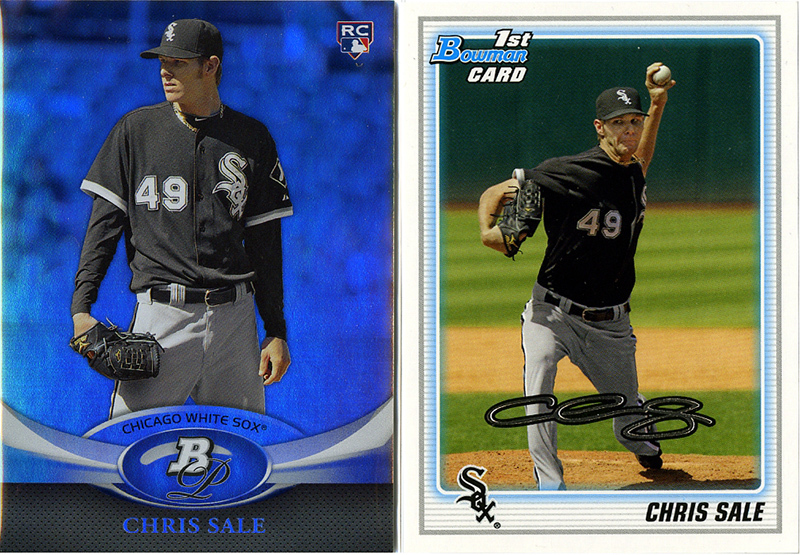 These are a bit more recognized as important rookie cards, and we can’t forget my undying love for Bowman Platinum. These two will fit nicely into my collection. The Swiharts were nice pick-ups as well. 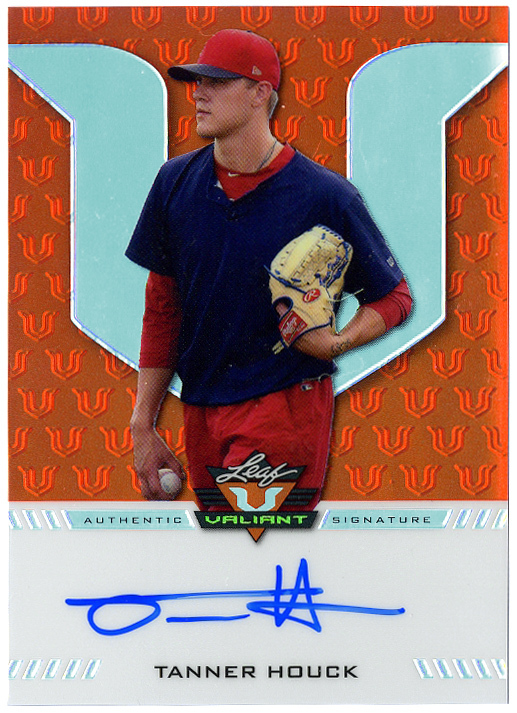 I had the base version of the “1st Bowman”, and found this nice black border. 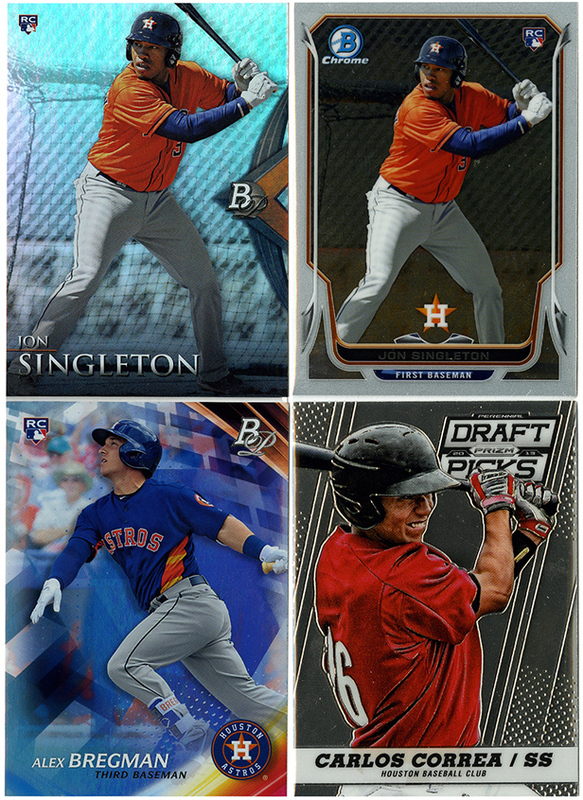 The more recent Bowman (2016 I think) was actually a “gray” parallel, which I sort of forgot they did. I didn’t remember having one of those, so it made it’s way into my stack of cards as well. I’m actually pretty proud of digging these two out of someones incredibly dirty dollar box. It was one of those really nasty, obviously been in storage, yellow’ed top-loaders, sorts of boxes. I had to pull them out of the top loaders to make sure they were ok looking, even though I’m not a “condition sensitive” sort of guy, and put them in fresh top loaders as soon as I got home. Both the rookie cards have been on my “Top 10 to find” list for at least a couple years now. Really really thrilled to knock those off the list. Apparently I’m going all-in on a Steve Wright collection, whether conscientiously or not. All three of these were at my favorite table at the show, the “$2 relic/auto” guy. He’s been there the past couple shows and has box after box of cheap hits. He’s also busted what must have been a dozen cases of Team USA products because the boxes are loaded with huge Team USA patches and autos. I didn’t have my “what prospect was drafted by what team” list with me, so I concentrated on Sox rather than prospects. 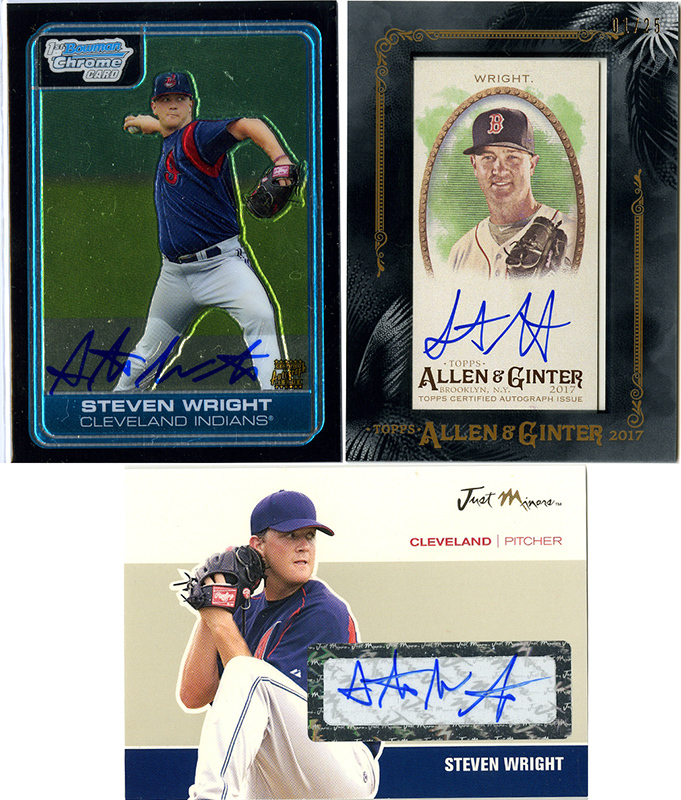 All three of these beauties knocked off autos I had been looking for for Wright. I’m especially happy with the /25 Ginter mini. Love those. Not a ton to say about picking up cards of a legend. I mean, there’s only so many cards like this that can be made. I love the old linen swatches. I like the design of the SP Legendary cuts a bit more than the Tribute, the first couple years of Tribute were kinda rough, but both are really solid cards. As for Peddy, there wasn’t much I could find this time around. Not that there’s anything wrong with a blue chrome refractor, I just wasn’t finding much else this year. Brian Johnson is an interesting one. He looks to have finally put the pieces together to make a full-time stand in the majors, but he has, by all accounts, the worse possible luck with injuries, line drives to the face, missed opportunities, etc. I’d love to see him do well, which is why I haven’t given up picking up cards of him. I think he still has a lot of potential, unlike a few other prospects that Topps keeps pushing cards of (looking at you Henry Ownes). 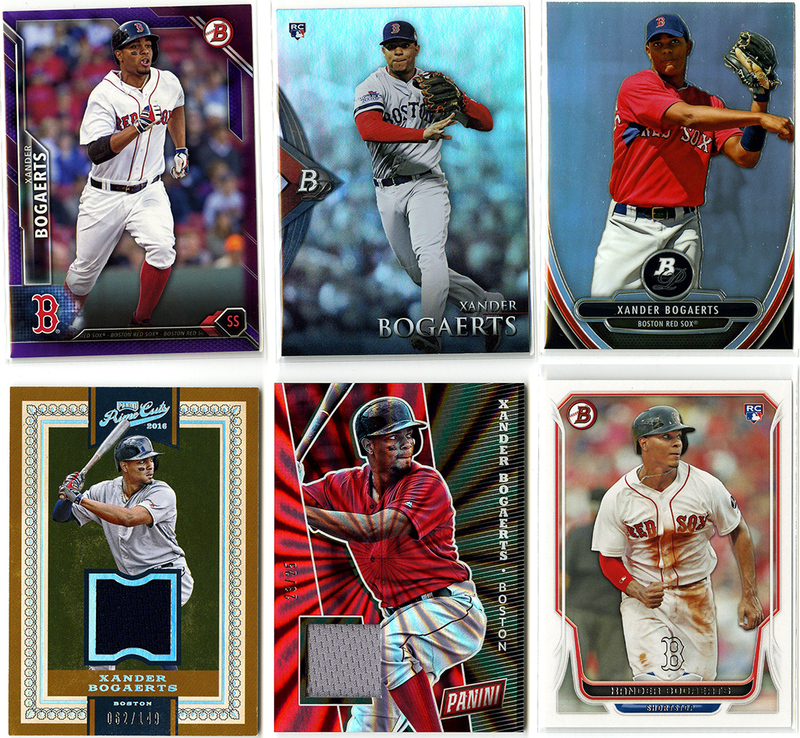 Just picking up more Devers cards in what everyone is hoping will be a huge breakout season for him. 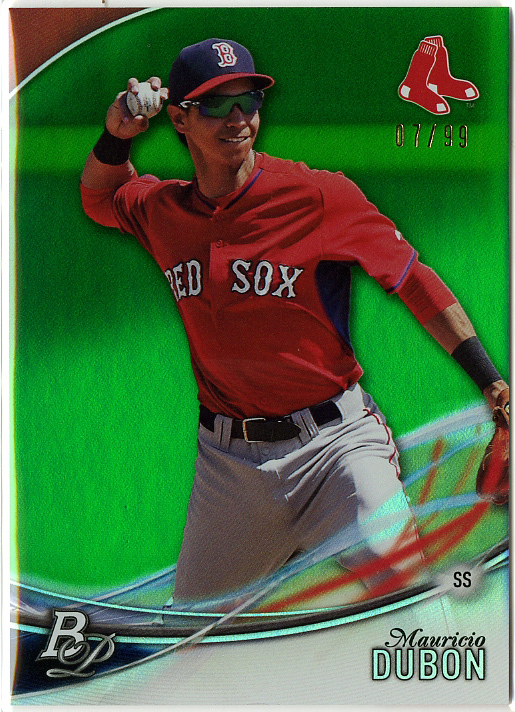 A nice chrome version of the Prospects card (from Donruss), this time from Optic. A simple Bowman, and a nice Bowman’s Best that I didn’t have. There’s going to be a ton of RCs to chase for him this year, but I’ve got most of the pre-rookies already taken care of. Ok, I’m going to admit it, I’m not a huge David Price fan. I don’t like the way he handles his business. If you come in and pitch like an Ace, like Sale did, than you can be a huge jerk if you want. Hell, Clemens was the biggest jerk on the planet but everyone let him be one because the guy was winning Cy Young awards. Price needs to have a ridiculously dominant year to earn back a little street cred. 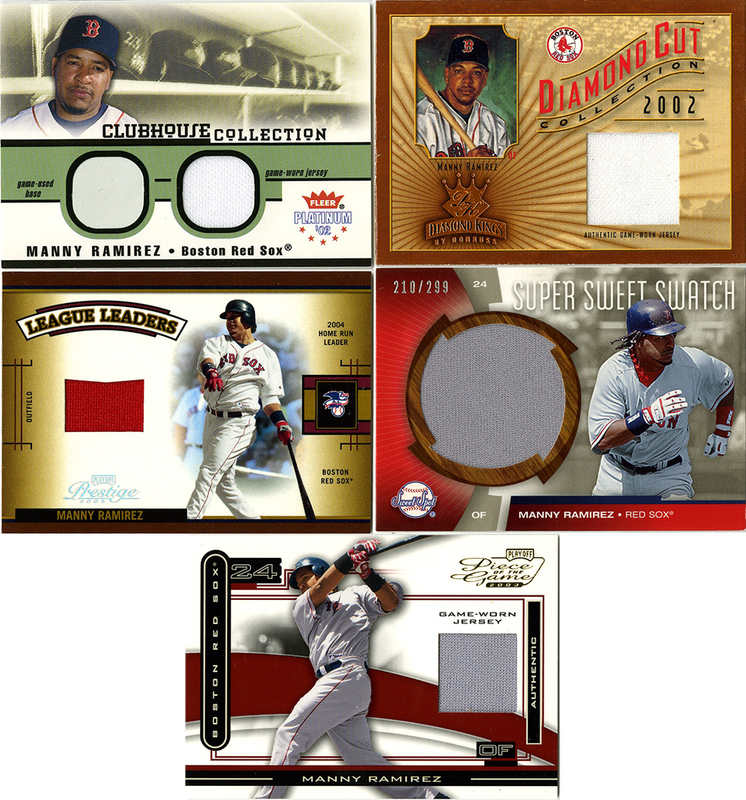 That said, I love those Diamond Kings relics, and Immaculate is always a nice brand. I wasn’t crazy about Gallery this year, but the numbered Press Proof is nice too. Good cards for a pitcher I’m not a huge fan of. I would love to take those words back. 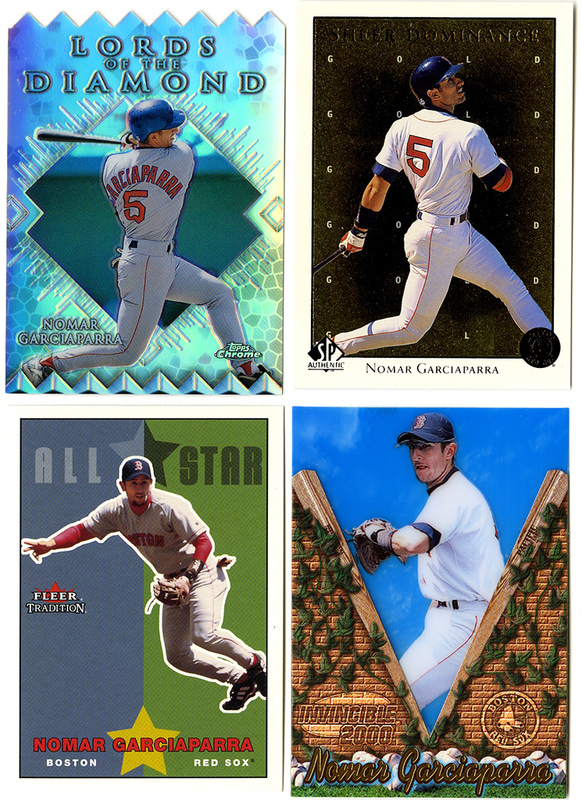 Out of all my player collections, Garciaparra’s is probably the biggest. I’ve lost track of what’s in it. I organized it by year at some point in an order to get it under control, but I still just pick up any Nomar card I come across. I’m 98% sure I have that Lords of the Diamond from Topps Chrome. I don’t really care. I like it. I probably liked it the 1st, 3rd and 9th times I bought it. The SP Authentic is a Sheer Dominance gold, which I’m pretty sure is a new addition to the collection. The Fleer Tradition was just for fun but also new, and that “Invincible 2000” is, of course, some crazy card from Pacific. It’s “card” on the walls on the front, but blue plastic/acetate in the middle. It’s nuts. The second picture I actually combined two scans into one: closed, and open. That Fleer Genuine Insider is one of the most unique cards I think I’ve ever seen. The relic part pulls out from the main card. It’s hidden “inside” the card until you pull it out. It sadly has a big chip it in by the pull tab, but I don’t really mind. It’s just a neat idea, low numbered, and I’m happy to add it to the collection. Found a couple nice Xander Bogaerts cards at this show. A purple Bowman parallel from 2017, a couple Rookie and Pre-Rookie Bowman Platinum cards, and a regular Bowman RC, which I already had but I’m more than happy to have another copy of. 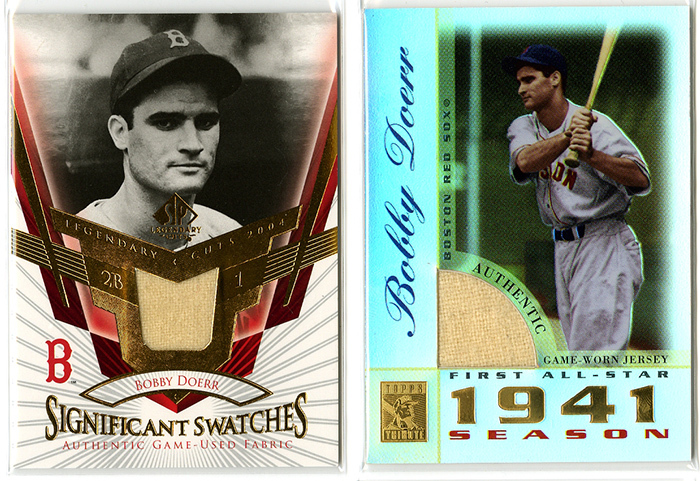 The real nice acquisitions were the 2016 Prime Cuts relic and the “Special Event” relic. I love Prime Cuts in almost any of it’s incarnations, but ’15 and ’16 appeal extensively to my retro inclinations. Being #/149 is just a nice touch. The other card, 23/25, and all sorts of shiny (the scan doesn’t do it justice), is either from Black Friday/Cyber Monday or from the National Card Show. I’m not sure which, but I really like it. 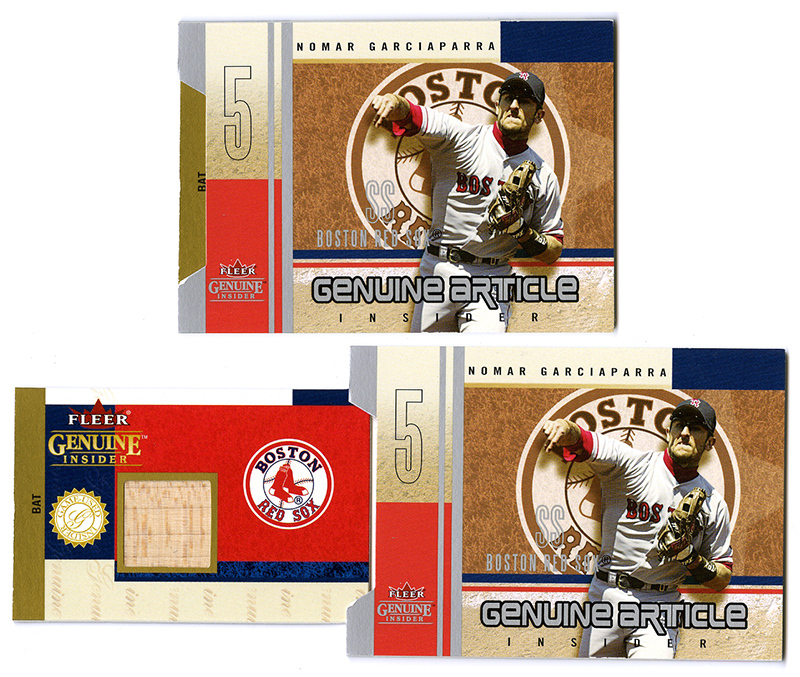 It goes without saying that prospects are the main component to dime boxes. People rip case after case of stuff like Bowman and Bowman Chrome and pull out those ultra-hot rookies they’re looking for, and dump the rest, which is great for me since I’m looking to pick up prospects on the cheap. At the top there’s a trio of Austin Rei cards, who’s one of the better prospects left in the Sox farm system. Bowman Chrome 1st card and two colored parallels (purple and black) from I think 2016 Bowman Chrome. On the bottom, a purple Kyle Hart, a blue Margot and a blue paper Shawaryn. The middle row has a bit of a mystery. 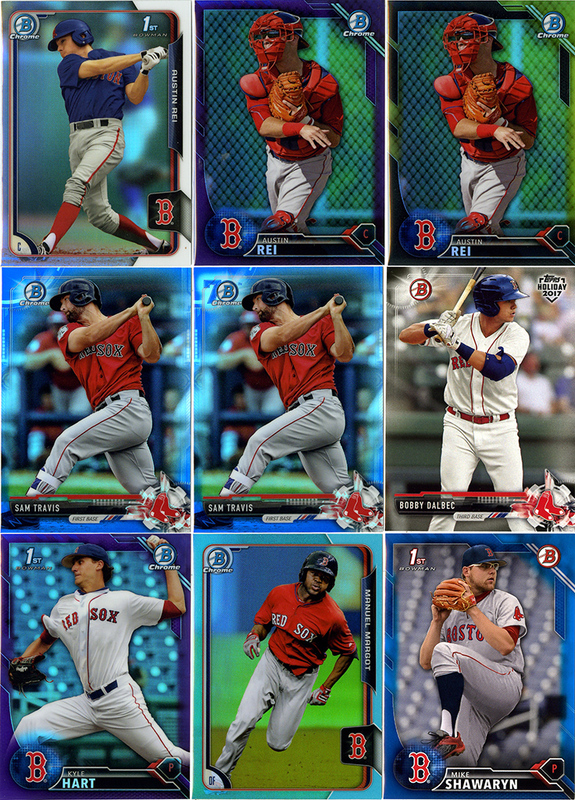 I thought I had bought two of the same Sam Travis cards, and at first glance they’re identical… except, around the Bowman Chrome logo in the corner. One has a “7”? What the heck? The one WITHOUT the 7 is numbered 004/150. The other isn’t numbered. They are both the same back, same card number (BCP170) and both have the same card code at the bottom (CMP023936). They are both the same color, same pictures, same backs. If they’re both blue chrome parallels, I don’t know why one is numbered and the other isn’t. Anyone have any clue? So, I’ve got a 70th Anniversary Blue (un-numbered) and a Blue /150. Neat! 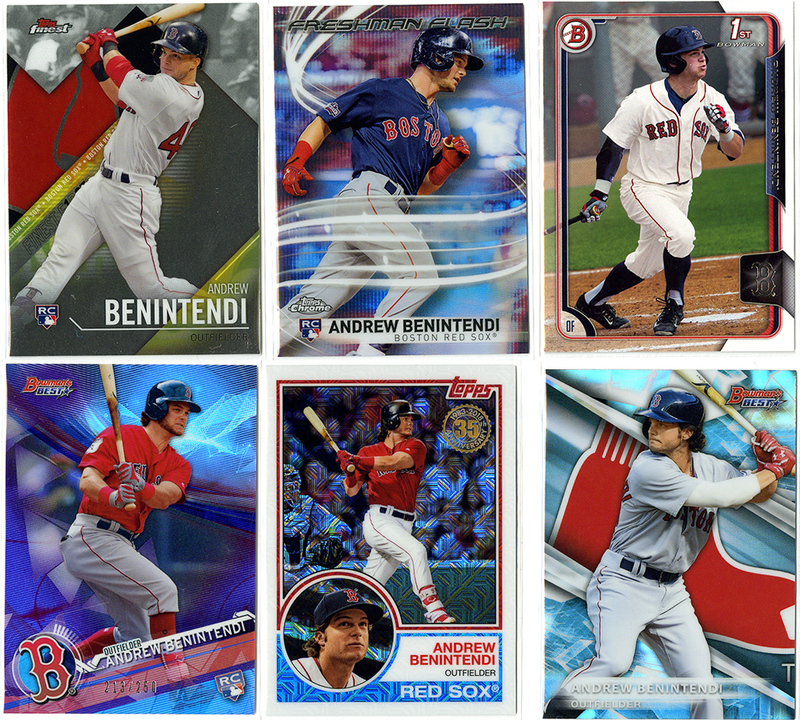 Gathering up Benintendi cards, even duplicates, was an actual goal I had going into the show. I have at least one copy of his rookie cards from most major products through my purchases of team sets last year, but getting a second (or third+) was something I was looking to do. That and find any that I might have missed. Along the top we have a fairly hard to find insert from Bowman Chrome two years ago, the Bowman Scouts Top 100. 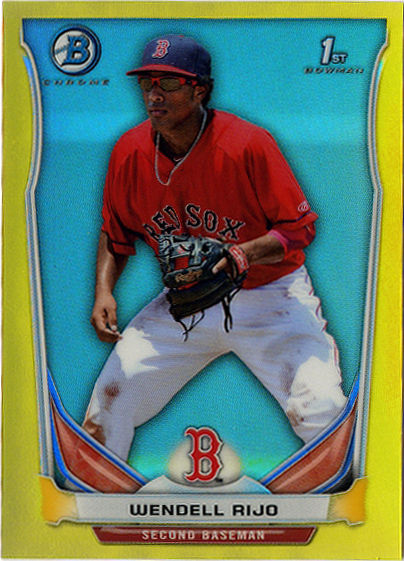 Then a yellow paper parallel of last years Bowman. Finally a Bowman Chrome “Fantasy Impact”, blue parallel, #/150. The middle has a couple additional copies of cards I already had, but they’ll go nicely into the newly formed player binder. At the bottom, three cards from Panini’s college card offerings. Two EExE and a 2015 Contenders for the University of Arkansas. Here’s a couple more Benny’s. The Finest at the top confuses me, since there’s another (different photo) card for him in Finest, so I picked this one up hoping it’s a photo variation. The Chrome Freshman Flash insert was a new addition, and the 1st Bowman was just nice to have another copy of. Along the bottom, that purple Bowman’s best is 213/150 and a really nice addition, I didn’t have it or it’s base version. The mojo refractor in the middle is from Series 1 this year, and the other Bowman’s Best is confusing given it’s lack of RC logo. All really nice pickups if I do say so. 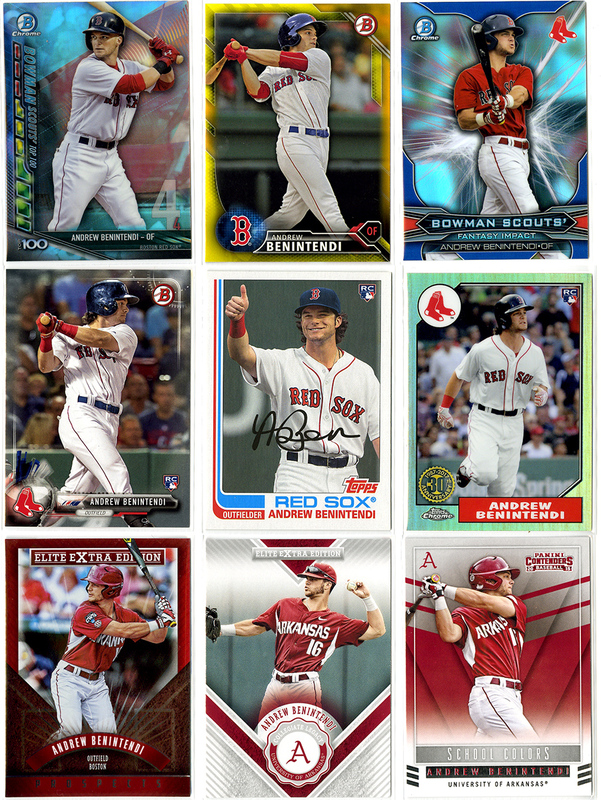 Here’s the rest of the cards I felt were scan worth. Lots of awesome stuff from this show, and couple I’m really happy to have in my collection. A 2013 Topps Sterling #/99 Red Parallel auto for Jon Denney. A 2014 Topps Chrome Mini Gold Parallel #25/25 for Wendell Rijo. And finally, an Emerald Green Bowman Platinum Mauricio Dubon #07/99. Yeah, I realize Rijo and Dubon were traded, but those were really nice cards and I couldn’t pass them up. 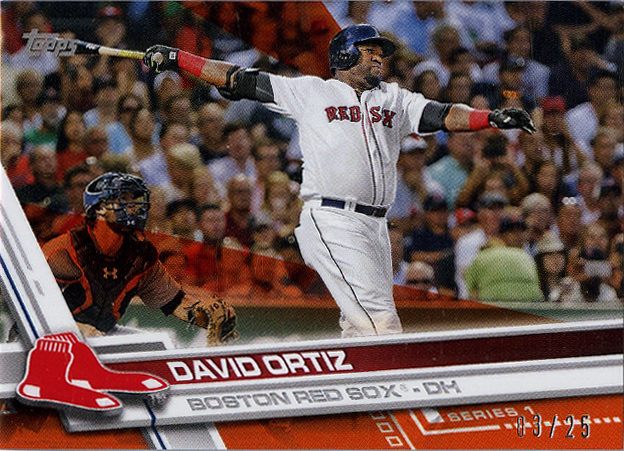 Next up, a really nice 2017 Topps Mini Orange parallel of David Ortiz, #23/25. After that, a 2017 Museum Collection patch for Rick Procello, #30/50. And finally, a 2014 Bowman Platinum Matt Barnes Team USA auto-relic, #/740. The irony of barely being able to hit a sticker with a pen on the Barnes card is not lost on me. Two awesome Immaculate Relics up next. The Porcello actually came from Sam, who handed it to me as we were walking in to the show. My first card of the day. Sam always finds the coolest stuff. 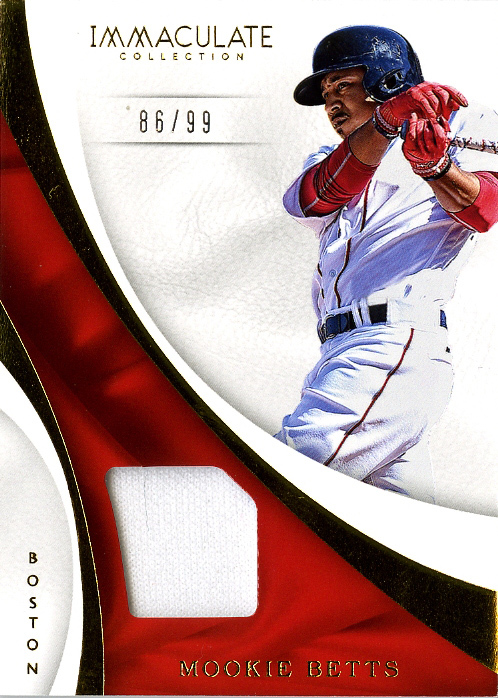 The Mookie came from the previously mentioned “cheap relics” guy for $2. Not going to pass that up. Both from 2017 Immaculate and both #/99. Now we’re cooking. Two awesome cards for two different reasons. First a black bordered mini from 2006 Ginter. Not only did I not collect when Ginter started, but the minis are a pain to even try and find. 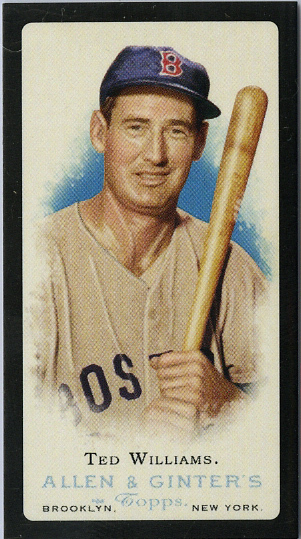 Finding a black bordered Ted Williams, for next to nothing, was awesome. 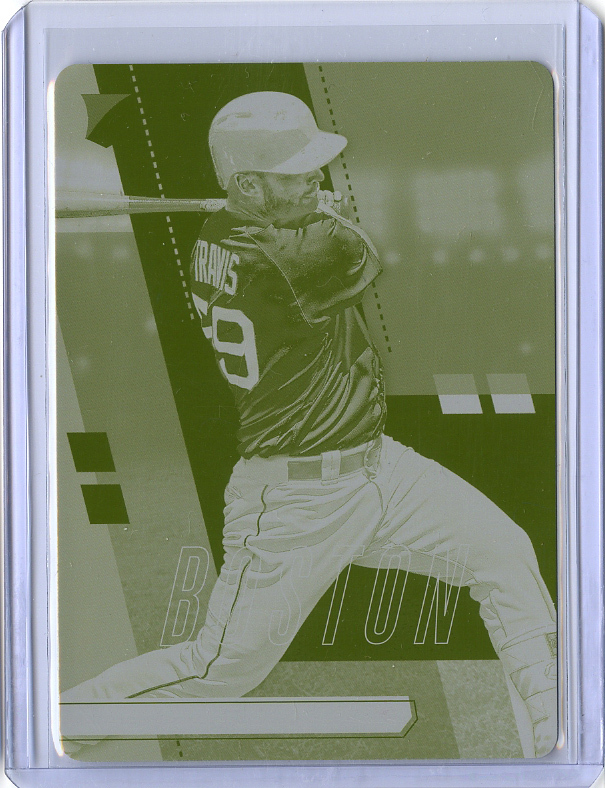 Beside that, a really neat yellow printing plate for Sam Travis, 1/1 obviously, from 2017 Panini Absolute. Beautiful plate. Last but not least, two exciting prospect autos for two talents who are actually still in the Red Sox system, and who haven’t been sold off by “Dealin’ Dave” in the front office, yet. 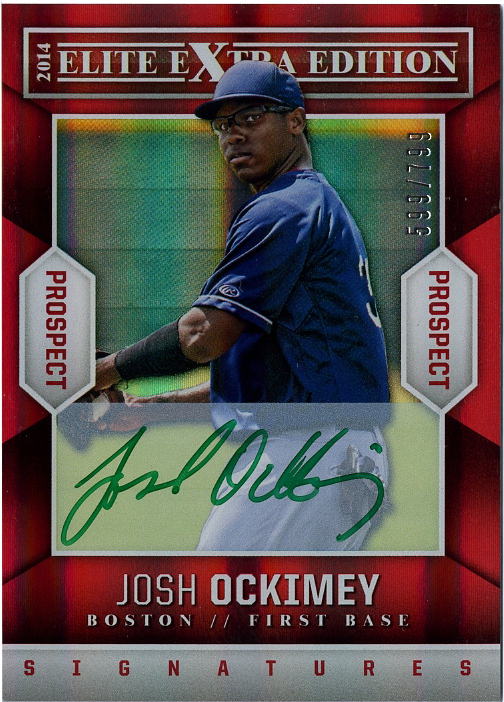 A 2014 Elite Extra Edition Josh Ockimey Auto, #/799, isn’t ultra rare, but while the talk surrounding the young prospect took a dip last year, he reportedly has the tools to bring it all around and be a considerably big league talent some day. Time will tell. The same could be said about the next card too. 2017 Leaf Valiant Tanner Houck, orange parallel auto, #11/25. Just being /25 was enough to convince me to pick it up for just a few dollars. Any of the other colored Leaf cards are sitting on eBay for $30+. First round draft pick, top 100 prospect, all good things. 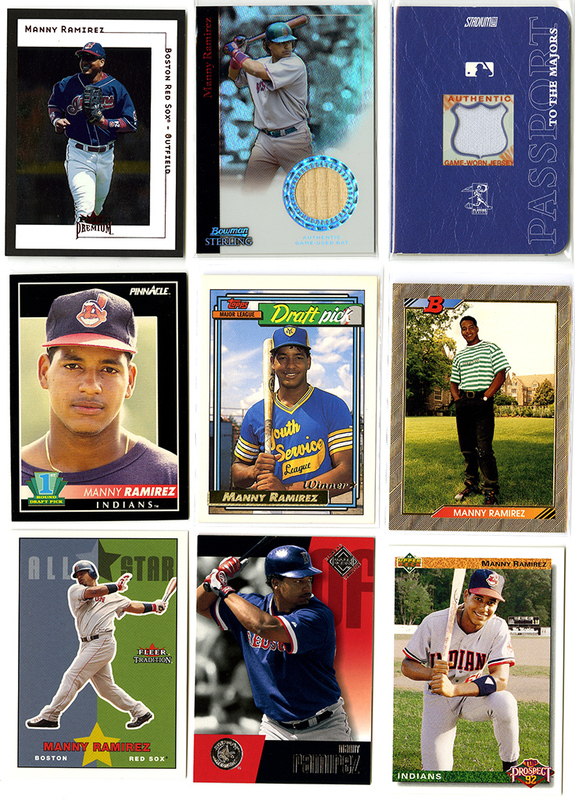 Well, that’s it for card show scans. I had a blast going with my good friend and picking up some really nice cards. It was a Saturday very well spent. Well, I can’t say I like the subject matter, but you had quite the haul. Lol. Thanks dude. This made up for my crappy trip last year, where I had only an hour and everyone was packing up. Much better stuff to look through this year. This Sam guy seems pretty cool. We all need a Sam in our lives. Haha, it was a blast man, can’t wait for the next show! Robin would really appreciate it if you’d help me not spend as much money next time. Haha!